I haven’t posted about it in a while, but I’m still trying to make the perfect burger. I’ve got several different burgers that I make and love — one with jalapeno peppers for when I want some extra zing, one with bacon and ranch dressing, one with barbecue sauce, etc. But my latest experiment might be the best one of all. I’m cooking and serving burgers with syrup. Yes. Syrup. Mrs. Butterworth’s, to be exact. Have you ever been eating breakfast, and you have pancakes or waffles on the plate along a sausage patty or two? When you have that combo together, sometimes the syrup spills over from the pancakes/waffles onto the sausage. And I love that taste. So I thought … if syrup is really tasty on sausage, maybe it’ll be tasty on ground beef. You may not be able to tell, but there’s syrup there on top, right with the ketchup. 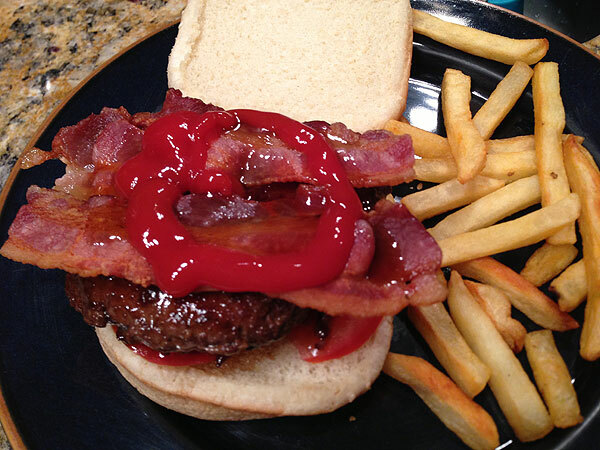 There’s also syrup used elsewhere in the burger, which I’ll explain when I find the best combo and post about it. My second attempt this past week was MUCH better, so I think I’m getting close. Hopefully I’ll have a new burger invention to report soon. interesting marketing potential.. remember when George starting eating his candy bars with a knife and fork? what if maple syrup producer teamed up with a recognizable hamburger brand.. would be interesting to see if that fuels a trend. I’ll swear McGee was the first.